Not to repeat myself, but I haven't been satisfied with Peter Milligan's Red Lanterns series since the beginning, and the only reason I didn't drop it with the second volume is because Red Lanterns Vol. 3: The Second Prophecy ties in to the "Rise of the Third Army" and "Wrath of the First Lantern" crossovers (completist that I am). This third book doesn't fare much better, both in telling a meandering, too-decompressed story and also in too many subplots that never actually pan out. Neither the Green Lantern: New Guardians series nor Red Lanterns are particularly well-treated by the culminating storylines of Geoff Johns's Green Lantern run. Both books are tertiary to the "Third Army/First Lantern" storylines; in both, the characters from each series make only small cameos in the stories' resolutions. New Guardians is the better story, not brought down by the vagaries of Red Lanterns, though surprisingly Red Lanterns is the more connected of the two, with an aspect of the "First Lantern" story tying (just barely) into the climactic Green Lantern #20. As with most of the other third volume Green Lantern books, Second Prophecy collects issues #0 and #13-20 of the series, plus the aforementioned Green Lantern #20. For most of the Green Lantern books, issue #16 marks a cliffhanger before the end of "Third Army" and issue #17 starts in another place with "First Lantern"; Milligan, to his credit, gets around this by having Red Lantern Atrocitus send the resurrected robot Manhunters to Oa in issue #16 instead of going himself, such that Atrocitus's story continues uninterrupted through the whole book. The "Third Army" story involves Atrocitus resurrecting the Green Lantern Guardians' Manhunters -- his sworn enemies, responsible for killing his family -- in order to pit them against the Guardians. For my tastes, Milligan would seem to over- and under-emphasize the wrong things here. For all the book's navel-gazing, there's not much discussion of the morality of Atrocitus turning to these genocidal robots for assistance; at the same time, Milligan uses three issues on Atrocitus recruiting the Manhunters, including a couple of fights and an imaginary sequence, when some of that fluff could likely have been cut back. The "First Lantern" story reads as equally thin. Milligan takes an entire issue for Atrocitus to dig underground and find the Guardians' "Great Heart," only for it to be immediately stolen by the First Lantern in the next issue. The First Lantern shows Atrocitus a vision of his life if his family hadn't been murdered, in which Atrocitus becomes a dictator and his family murders him, leading Atrocitus to "choose" the current reality. Ridiculously, this causes Atrocitus to now blame himself for his family's murder and to order the Red Lanterns to kill him, effectively committing suicide. The Red Lanterns comply without question, but in the span of an issue again Atrocitus has "found himself" and regained control of the Lanterns. The motivations of the characters shift with the story -- Atrocitus wants to die, then he wants to live; the Red Lanterns are happy to kill their boss, then to follow him again -- and it's hard to feel for the characters when they're so ephemeral. This is not even to mention the side trip that Red Lantern Bleez and the human Red Lantern Rankorr make to Earth, in which Bleez wants to steal Rankorr's powers, he stops her, and then ... really nothing. Dex-Starr, Atrocitus's loyal companion, goes to Earth to find Stormwatch's Midnighter and ... kills someone else instead and that's it; that more is not later made of the fact that Dex-Starr is willing to kill Atrocitus on command is a missed opportunity. Also, a running subplot of Red Lanterns since the second book has been the Five Inversions, demons who gave Atrocitus his powers, poisoning the Red Lantern battery and slowly taking over the Red Lantern corps. Chalk it up, perhaps, to Milligan's run on Red Lanterns coming to a maybe-sudden end, but in the issue #20 finale, the Red Lanterns finally go up against the Inversions and ... beat them handily. It's a too-cutesy end to what seemed like a serious storyline, and for me the resolution fell flat. There is some good suspense right at the very end in Red Lanterns #20, when Sinestro murders all of the Guardians but leaves one for Atrocitus. Throughout Red Lanterns and even in Atrocitus's Green Lantern appearances before that, Atrocitus has sworn he'd kill a Guardian in revenge for the actions of the Manhunters, and finally he stalks the last of those Guardians. I felt rather mixed emotions here; on one hand, it's a brutal scene and no one wants to see a little blue Guardian executed, but on the other hand, for Milligan to have had Atrocitus turn away from killing the Guardian after all this time would leave Atrocitus's arc unresolved. Milligan does have Atrocitus murder the Guardian and the moment comes off earned and appropriate, and up until the conclusion I felt quite riveted, unsure what would happen. 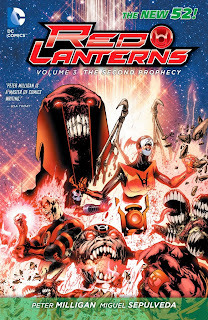 I like the Red Lanterns characters very much -- Atrocitus, Bleez, Rankorr, and the rest -- and I regret that I never quite got the swing of Peter Milligan's run on the title. I tend to wish writers would stay on titles longer (though twenty issues is nothing to sneeze at), but in concluding with Red Lanterns Vol. 3: The Second Prophecy, I think it works out. Red Lanterns continues, but under a different team; hopefully Charles Soule and company will have new life to bring to the title. Later this week, Dark Horse's Star Wars: Darth Vader and the Cry of Shadows. I'll definitely give it a shot. From what I understand the book newly stars one of my favorite Green Lanterns and also ties in to the Super-titles, so that's enough of a draw for me. Are you reading Soule's Swamp Thing? Equally recommended? @ CE Yes! Charles Soule is a godsend of a writer. His Red Lanterns and Swamp Thing are excellent. His RL's clears up more in 3 issues than Milligan ever did in 20. And his Swampy harkens back to Alan Moore era with a mix of horror, humor, and oddness about it.